Although it is ​Brazil's fourth largest city, Recife hasn't lost its traditional and cultural attractions to commercial development. 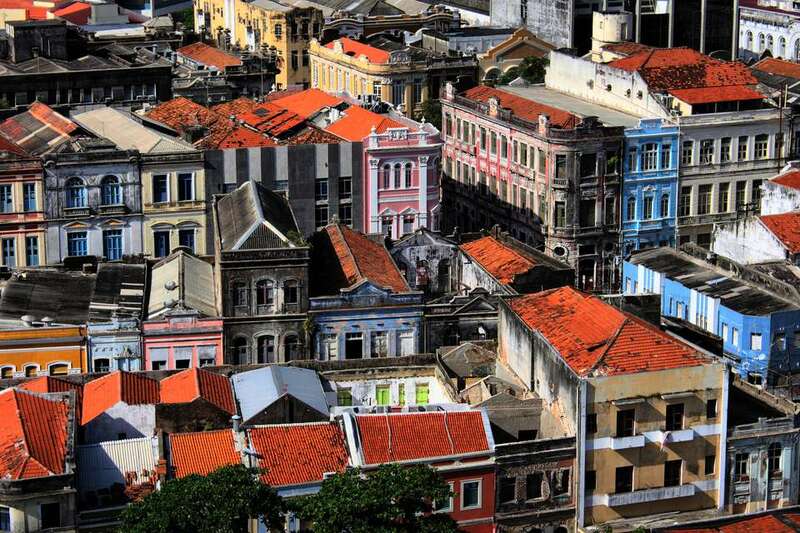 The capital of Pernambuco state in northeast Brazil, Recife is a fluid mix of new and old. Protected by the reef that gives the city its name, Recife is built around a number of inlets, canals, and bridges, living up to its name as the "Venice of Brazil." It offers walkable tours, great beaches, and lively arts and entertainment. Recife is beautiful anytime thanks to its average year-round temperature in the 80's. However, the city puts on a great carnival so you might want to schedule a visit to the Recife and Olinda carnivals in February/March, or to the off-season carnival, called Recifolia, in October. Either occasion means thousands of visitors, so make your reservations early. Brazil is known for its beaches and Recife is no different. One of the best places to catch some sun is Boa Viagem, an upscale area, which also offers most of the restaurants and nightclubs—some of which are oceanfront. Just keep in mind that this beach is known to have bull sharks, so you may want to stay on the sand instead of going for a swim. Take a walking tour of the old city from the Praca da Republica to the impressive, 19th-century Teatro Santa Isabel and then the Catedral de Sao Pedro dos Clerigos. Next, browse through the colorful Mercado do Sao Jose (Saint John's Market) for local arts and crafts and handiwork, including a special section for lace, and finish your walk at the Basilica de NS da Penha. The Shopping Center Recife is Brazil's second largest shopping center. It's been open for more than 30 years and now features around over 450 stores, 90 food options, and 14 cinemas. The mall is just five minutes from the Recife International Airport and a few blocks from the Boa Viagem beach, so it's a prime spot for tourists and locals alike. The cross-shaped Casa de Cultura is one of the most interesting buildings in Recife. Dating back to 1850, it was originally a prison and is now a crafts and arts center that sells souvenirs. There are now about 150 shops selling local pottery, dolls, board games, leather accessories, embroidery, paintings, and more. There's also a food court where you can try some of Pernambuco's cultural meals and on the third floor is Frevo Museum, which showcases traditional music. Olaria de Brennand is a ceramics factory with a display area of thousands of pieces. It's like an open-air museum dedicated to Francisco Brennard, an artist born in the 1920s. He inherited the brick warehouse from his father and turned it into a studio that is now a gallery. Museu do Homem do Nordeste is considered one of Recife's best museum. It displays art and objects that shows the anthropology, history, and culture of the people in this region. The museum's modern galleries were built in 1979 to showcase local artifacts and works. Olinda is the reason many visitors travel to Recife. Olinda is a living museum, a UNESCO heritage city, and considered to be the origin of the entire Brazilian culture of the 16th century. It's also very charming, with old stone churches, bright and colorful buildings, a stunning beach with coral reef pools, and more. Two months before the actual date, the Carnival rehearsals start and the blocos, or carnival section or group, draw in hundreds of watchers. The main dance is the frevo, an energetic, exhilarating experience. In Olinda, everybody participates. Don't forget to bring your costume—you'll need it to fit in with the festivities. In Olinda, the Folclore Nordestino festival at the end of August is a highlight of dance and music from the entire northeastern region. Heading to South America? Don't do these 5 things!